I have a passion for wilderness skills and encouraging others to go into the woods, to experience nature through the lens of bushcraft. I do sometimes fear, though, people may be put off from experiencing nature in this way. If this is the case, then I see it as a great shame as bushcraft is so beneficial and enriching. 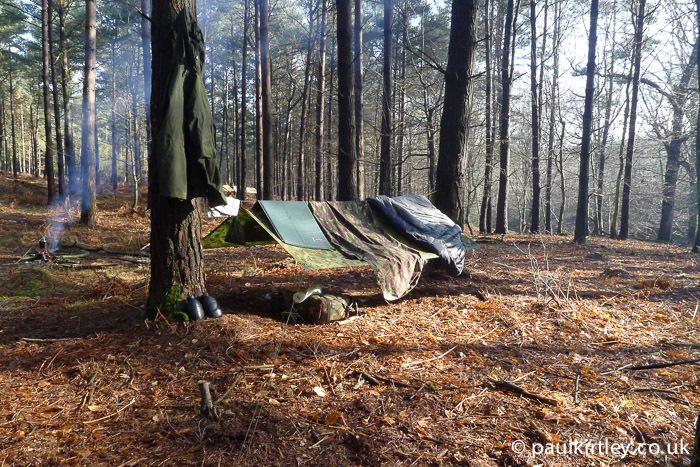 It seems some are given the impression of bushcraft as an activity that necessitates heading out to the woods with nothing but a knife, having to sleep out in an improvised shelter and forage for your dinner. While these things are all possible with sufficient skills in different aspects of bushcraft, this combination is daunting for someone who has limited or no experience of even camping out. Second, I see a proliferation of particular types of clothing and equipment associated with bushcraft in some circles. It seems this puts some people off too – they want to learn the skills of finding resources in nature – carrying less by knowing more – but the message being sent to them is that they must have all manner of leather pouches, an array of expensive custom belt knives, not to mention an antler handled neck knife and an antique tinder box. 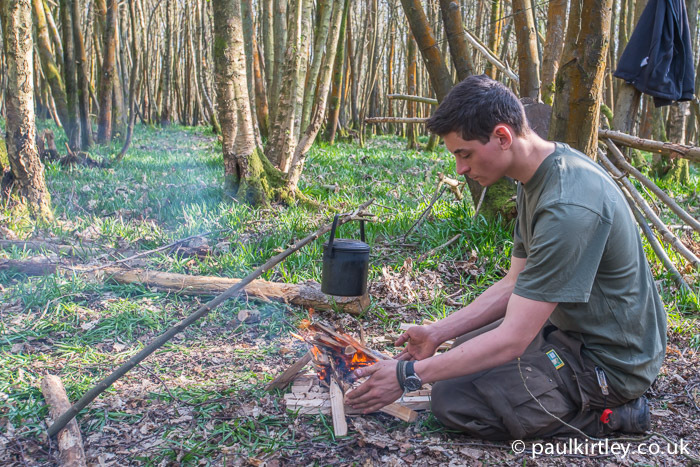 The truth of the matter is you don’t need much to equip yourself with what’s required to explore the world of bushcraft, to start making greater use of the natural resources all around you and having a much more immersive, connected and direct relationship with the natural world. Nor do you need to be uncomfortable as you move down this path. What I’d like to do here is explain the few things you do really need to begin your bushcraft journey as well as include a little of the why. I should premise what follows with stating I’m assuming you have some outdoor clothing and footwear. If you are out for the day, you’ll probably need a daypack to carry items such as waterproofs, sandwiches and a drink and, again, you may already own something suitable. If you are out for an overnight camp then you’ll need a bigger pack to accommodate extra items such as a sleeping bag and a cooking pot. None of this kit is particularly specific to bushcraft and so I will not cover it in more detail here. If you want to see more wildlife then I’d recommend mute, natural colours for your clothing and pack. I’ll also assume you have the navigational skill to get to and back from wherever you choose to go to explore the woods and exercise some bushcraft skills. Clearly under many circumstances a compass, map and the ability to use them would be prudent. The most important things to obtain in order to undertake many of the skills you might be interested in are some cutting tools. You don’t need to spend huge amounts of money, though, because there are very good basic cutting tools available for relatively little money. You will need a knife suitable for the carving and craft elements of bushcraft. A fixed-blade knife with a comfy, ergonomic handle and an uncomplicated blade with a fine flat bevel is all you need. Size-wise, a blade length something in the region of your palm width will serve you well. Most of what you’ll be doing is cutting and carving, not hacking. The Morakniv 840 Companion has pretty much become the de facto standard entry-level knife for bushcraft. It deserves its reputation as a robust, reliable knife, providing exceptional value for money. A knife will get you a long way but you should also acquire a folding saw. Saws are very efficient at cutting across the grain of wood and this will help with many of the jobs which a knife is not particularly well suited to. Saws are also generally safer to use than knives, making some tasks much less risky than using a knife alone. The Bahco Laplander, effectively a pruning saw, is very well suited to the small woodcraft jobs and firewood processing you’ll be doing. I like this model of saw as the blade is hard to snap (unlike some similar models) and the blade locks both open and closed, meaning the chances of cutting yourself unintentionally are reduced. The size of the jobs it will deal with is of a similar scale to those your bushcraft knife will tackle comfortably. The two tools together form a powerful combination for little weight and limited cost. If you use your knife for a time it will become blunt, so you need some sort of sharpening stone. For sharpening back home, a combination oilstone or combination waterstone will serve you well. You don’t need anything expensive; just what’s available at your local hardware or DIY store will work fine. When you head for the woods, you should think about taking a pocket-sized sharpening stone. Bench stones are too heavy to carry, unless you like carrying bricks around with you. While not strictly necessary for single day out, as you can sharpen your knife on a bench stone when back home, it is good practice to have the ability to sharpen your knife while you are out and about. If you blunt your knife while out, then you’ll need a small whetstone. If you head out for an overnight stay or longer, then a small pocket whetstone for the trail should definitely be in your kit. As the old saying goes, you are only as sharp as your knife. The other item you should grab when you pack your knife is a cuts kit. This is a small first aid kit with everything you need for dealing with cuts you might suffer from your knife. While you should be careful to employ all the rules of basic knife safety, accidents sometimes happen. In addition, handling rough, abrasive natural materials, sharp plant fibres, thorns and the like, as well as the potential for minor burns from campfires, all mean having a small first aid kit is prudent. I would recommend putting together your own kit to contain the items you want in the appropriate proportions. These can be purchased from a local pharmacy or online. You’ll end up with a better-stocked kit containing higher quality items than most off-the-shelf kits. Another element of outdoor skills that separates bushcraft people from many in the general outdoor population is the deft use of fire. Fire is probably the most important bushcraft skill, certainly one of the most important survival skills in many environments. As a species, our ability to ignite and harness fire is unique yet, for many, lighting a fire in the woods is not always straightforward. It can indeed be difficult depending on the temperature and humidity of the air as well as the amount of moisture in the ground, not to mention if it’s raining. So having a range of different fire lighting techniques at your disposal is very, very useful. Having a range of various fire management skills is also very important. We can split fire lighting up into two main stages really: the first is ignition and the second is taking a small flame up to an established fire. There appear to be many individual methods of ignition but they all boil down to six categories, these being sparks, friction, chemical, electrical, solar and compression. The most universally reliable single method is sparks. Part of the reason for this is that the gadgets and devices required to generate the sparks are pretty impervious to moisture or even being immersed in water. Moreover these devices tend to last a long time because they are simple, with no moving parts to break and the amount of material consumed in each strike of a spark is small. So you’re always going to be able to create the sparks you need. What you do with those sparks to create a fire is where knowledge of natural tinders and kindling comes in. Yes, we’re talking bushcraft. The modern sparking devices known variously as a Swedish Firesteel, fireflash or ferro rod are the most widely applicable gadgets for creating sparks. The sparks they produce are bright white (i.e. very hot) and relatively large, thus the range of different materials that they ignite is the broadest of any of the sparking devices. I would recommend investing in one of these and learning to generate good sparks with it. Then see what you can ignite with your sparks. Do be careful in dry conditions, however, as fires can quickly spread even from the smallest sparks. Remember to seek the correct permissions needed to have a fire in your jurisdiction. The more traditional flint and steel generates smaller and cooler sparks but is very reliable if you prepare the necessary materials correctly and have good technique. The range of materials you can ignite is more limited than the modern devices but it’s worth experimenting with flint and steel once you get the hang of using a modern firesteel. This will extend your knowledge and understanding of natural fire lighting materials. Whenever you are out and about, it is sensible to have a water bottle with you. A litre of water is a good minimum amount to carry with you. Water is heavy, though, with a litre of water weighting one kilogram. If you are out for more than a day, then you will have to procure some water while you are out. If you take a metal container then you can also boil water if you need to, using fire. Boiling is a very reliable method of making water safe to drink, as a rolling boil will kill all pathogenic organisms. I tend to carry a metal mug even when planning to be out for only the day, just in case. If you carry a water bottle and a metal mug with you then you can always produce and store drinking water free from disease-causing organisms anywhere you find it in the wilds. When water is murky you need to pre-filter the water to remove suspended matter. A Millbank bag or one of the newer Brown Filter Bags is a really good way of doing this. These bags provide a low-cost, low-tech (read hard-to-break), reliable method of coarse filtration, something that is necessary in all but crystal clear waters. To remove any turbidity from the water is important because suspended particles in water can irritate your gut even if there are no pathogenic organisms present. This means pre-filtering with a filter bag followed by boiling is an excellent methodology. If you need to produce more water than you might in a metal mug, you’ll need to carry a billy can. You are most likely to need a billy for water boiling and other cooking tasks if you’re camping overnight. This brings us neatly on to camping out. Now of course you can camp out how however you want. Sleeping out in a tent doesn’t mean you are not doing bushcraft. Indeed in some parts of the world, even in the bush, it’s the best option to sleep in a tent. That said, one of the iconic methods of bushcraft camping is sleeping under a tarp. Whether you are sleeping on the ground or sleeping in a hammock, a tarp is a good shelter, providing a good amount of ground coverage for its weight in your pack. 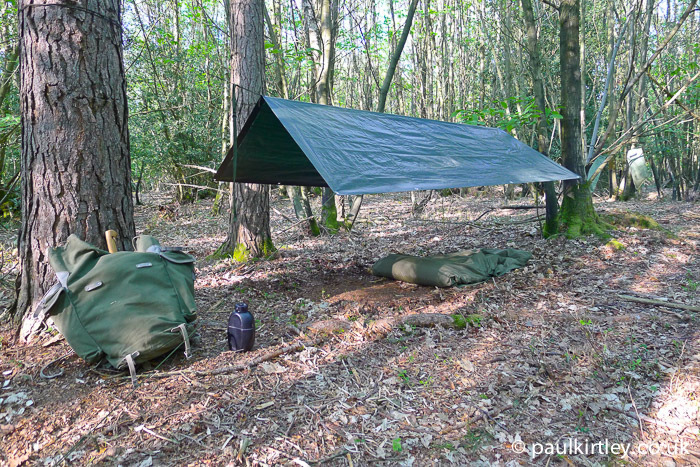 Tarps are particularly well suited to sleeping in woodlands. They are easy to pitch, particularly with knowledge of a few simple yet versatile knots and plenty of trees to tie off to. You can also make tent pegs and other simple camp items you might need such as candle holders, using your knife and saw. So, all you really need to have in your bag to create a decent shelter in the woods is a tarp with guy lines attached. You don’t even need to spend a lot of money. You can buy a small builders tarp or a trailer tarp from a motoring store and add some nylon cord for the guy lines. If you’re going to sleep out then you’re likely going to need a sleeping bag, although some people like to sleep out with just a woollen blanket. I would recommend most people who are starting out with tarp camping should start with a sleeping bag, rated to a comfort temperature for the season you are camping in. Down sleeping bags are lightweight and compress small, but are expensive. A summer-weight synthetic bag is not too bulky and can be had for little money. If you are starting your bushcraft camping journey in the warmer months of the year, then this latter option is what I would go for. If you are sleeping on the ground you’ll need an insulating sleeping mat to minimise heat loss to the ground as well as increase your physical comfort. Another thing that you’ll need is a bivvy bag. This is basically a windproof and waterproof bag for your sleeping bag. This serves several purposes. The first, as my description would suggest, is that it protects your sleeping bag from moisture both in terms of rain but also just in terms of dew. A bivvy bag makes your sleeping bag more windproof as it allows air warmed by your body to remain within the sleeping bag without being displaced by cold drafts. In addition a bivvy bag traps an additional layer of warm air around your sleeping bag, thus increasing the warmth of your sleeping system. Finally a bivvy bag protects your sleeping bag from dirt, which over time would degrade its performance. You might aspire to sleeping out in improvised shelters but I would suggest initially you become familiar with sleeping out for one or more nights under a tarp. 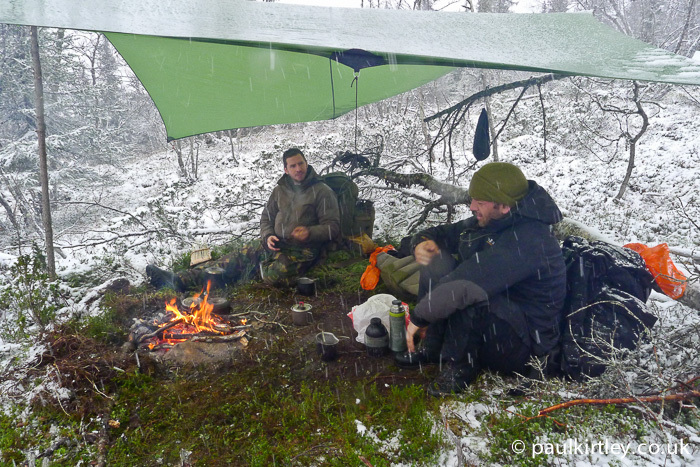 You can then progress to building improvised shelters but still using your bivvy, sleeping mat and sleeping bag. As your shelter skills increase, being confident you can create weatherproof thatching, being able to construct comfortable, insulating beds as well as having the fire management skills to keep a fire going all night, you can progress to sleeping out using nothing but your skills. 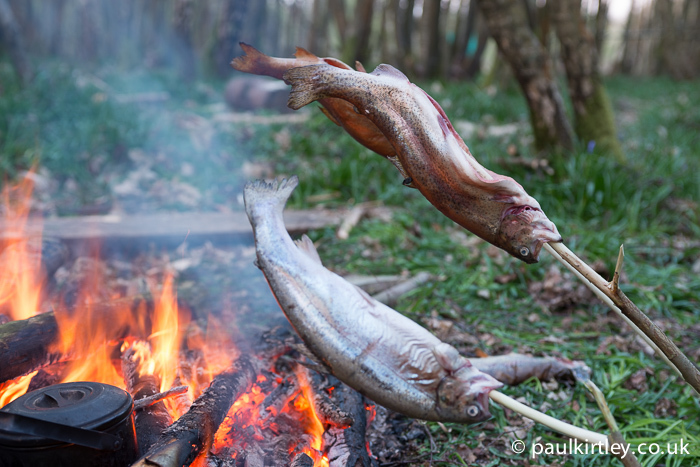 If you stay out in the woods overnight you’ll definitely want to do some campfire cookery, even if you start off relatively simply. Above I mentioned the value of having a billycan for boiling water in camp. Equally a billy pot is useful for camp cooking too. There are many one-pot meals that can be prepared. You should make sure your billy has a folding handle or bail, from which you can suspend the pot over the fire. This is something you should take particular note of as many camping pots for sale in mainstream outdoor stores these days are designed to be used on gas burners or petrol camping stoves or similar. They are not designed to be hung over a fire and therefore they have no means of suspension. 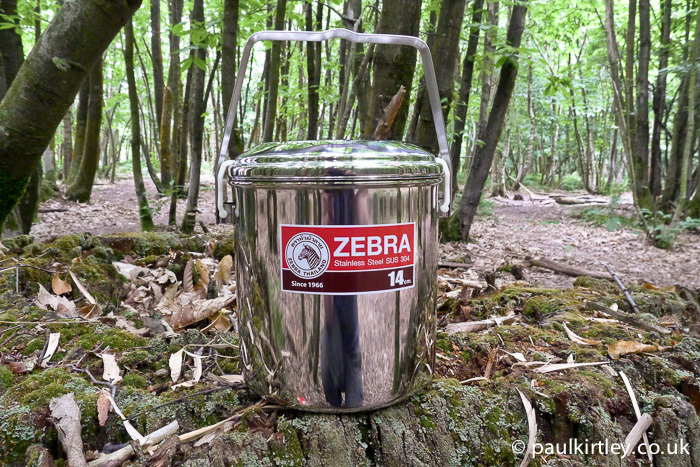 The billycan that has been adopted by many bushcrafters, making it almost standard issue is the stainless billy by Zebrahead. This is a high quality, robust stainless steel pot, which is very much worth the money. They come in a range of sizes, the most popular being 12cm, 14cm and 16 cm diameter pots. 12cm is good for individual use if you are looking for a compact pot although personally I find them a little small for cooking. 14cm is good for one to two people both for boiling water and cooking a decent meal. You’ll need an eating utensil. I’d suggest a spoon is the most universal. You can of course take a spoon from home or an example of the ubiquitous spork to start off with. One of the first carving projects you might like to consider undertaking in terms of learning woodcraft and carving techniques is carving your own spoon. Learning how to make things from natural materials is part of bushcraft. Carving a spoon is a really good self-contained project as it’s not a huge time commitment to complete but it does teach you many different carving techniques in a small compact project. It also gives you a nice, practical item at the end of the process. Moreover a hand-carved spoon is something you can take with you on your journeys, adding to the happy memories attached to what is already a personal item. An additional item that will prove useful is a good hank of paracord. Strong cordage is hard to manufacture quickly from plant fibres as and when you need it. So carrying some good quality, strong nylon cordage is sensible. Useful for everything from a washing line in camp to repairing a rucksack strap to lashing a shelter, paracord has many uses. Carrying string in your pocket is also good if you want to learn knots and lashings as you can practise them as and when you want. If you want to progress onto learning bow drill friction fire, then having some paracord is very useful as it is more challenging still to practise friction fire with natural cordage made from plant fibres. I would suggest you become completely familiar with the technique using nylon cordage first. In reality if you ever need to employ this technique out of necessity then the most expedient way is to use strong cordage that you carry with you. Traditionally this was a length of rawhide. The modern answer is nylon cordage. As well as carrying paracord in your pocket, you have shoelaces as well as drawcords on rucksacks and the like. What are other things you might want to have with you? We’ve talked about carving already. Your basic bushcraft knife will enable you to undertake most of the carving and woodcraft skills. One task you will struggle to complete with a straight-bladed knife is carving a bowl, even the shallow bowl of an eating spoon, never mind a larger serving spoon or ladle. A curved knife designed for this purpose makes easy work of the job. The smallest of these types of knife, generally known as spoon knives, is a good investment. They come in right-handed and left-handed versions. At first get one for your dominant handedness. 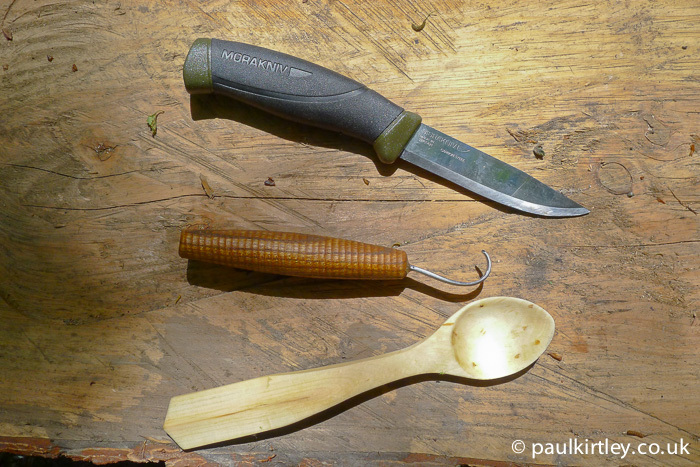 This in combination with your bushcraft knife will enable you to carve all the small the small to medium sized utensils you might ever want. In winter the days are short and most people would probably think to pack a head torch for a day hike. In the long days of summer, however, packing a headlamp is maybe less obvious. In summer it’s worth remembering the night-time interior of deciduous woodland is typically pitch black due to the density of leaf cover above. Even if you don’t intend to be out in the woods beyond the end of the day, I’d recommend you take a head torch just in case you’re out longer than anticipated. If you are benighted, then having a head torch with you could make the difference between being forced to spend the night in the woods or making a call for help and arriving safely back at your intended destination, albeit late. A version of this article was first published in Bushcraft and Survival Skills Magazine. As the weather gets colder, I really appreciate all of these articles! I will be going out for a 2 night/3 day trip this weekend. I have my base camp built, an LLbean Pine Tent. But I will be trying tarp camping in November. My problem has always been that I bring too much. So your articles are very helpful. I am working hard to reduce. I use a Bio-lite stove, which is light weight, and practical for me. I can cook all my meals on it without using a lot of fuel. I particularly like your idea about the bivy bag for my sleeping bag, as that always gets dirty fast and I have to have it cleaned often. I have my favorite kitchen knife with me always, but I haven´t tried carving yet, so I will use your suggestions for a knife. A saw is also a good idea. Great article and right on the money as usual. One thing I would add to a basic set of items is a notebook or journal for sketching and recording events, objects and findings in. It doesn’t need to be anything Hi-Tec or all singing and dancing hi speed tactical, Just a simple A5 sketch pad or note book with a standard HB pencil, “one with the eraser on the end if you want to be posh”, and keep it all in a ziplock bag for weather protection. I have gone up market and invested in a hard cover A5 notebook and made a canvas slip for it that is treated with wax to protect it from rain and moisture. My scribbles and sketches are great works of art “not” and useful for future reference. Keep the great content coming. We all really appreciate the time and effort you put in for us to enjoy and learn from. As a newcomer to Bushcraft, I was lucky enough to stumble accross your website before I had spent too much money on “bushcraft kit” ( but, unfortunately, not before buying a relatively expensive knife!) So, the rest of my limited kit is just stuff I had from years of rambling, my sons old Dof E stuff and a folding pruning saw I found in my shed. As a beginner, there are two things I now never leave the house without; my pocket guide to identifying British trees and a couple of coffee bags (like teabags, only with fresh coffee in them,) both of which I would highly recommend to anyone. I’m pleased to say, that after some pretty tense negotiations with my wife, I have put the money I’ve saved not buying “kit” towards a Bushcraft Essentials Course in the new year. Are you attending the April Essentials course? If so, I’ll see you there. Yes I am. I look forward to meeting you. I’d add alcohol-based hand sanitiser to this, not just for cleaning your hands but also for sterilising cuts, scrapes and insect bites. And I know it’s not really doing things properly but in an emergency on a wet day a squirt on your tinder is a sure fire way of starting a fire. Keep banging the drum Paul, the message still needs to be put out there judging by the numerous Bushcraft (cough cough) youtube videos and websites out there…. Very interesting article. Back when I was first interested in bushcraft I was initially put off by the expensive kit deemed necessary by most of the so-called experts on the Internet, namely YouTube. Then I found your blog three years ago. Been a happy camper since! We all appreciate your great content. Thank you and keep it up! Hi Paul, High quality and considered article as always. I was thinking as I read WRT muted clothing and colours. These are great to blend in and see more wildlife. Equally though we should consider if things do go wrong for whatever reason, the muted colours will make you harder to find by any rescue team. As such, perhaps people may want to consider packing something high- contrast coloured against the background to allow them to be located more easily. Yet another great article. One thing I have noticed is that your articles never mention bears. Bears are a big deal where I practice bushcraft. 270kg grizzly bears in fact. So the one piece of kit I recommend everyone in my area carry is a can of ‘Bear Spray’ and know how to use it. You did mention map and compass. The biggest reason people end up in survival situations is that they have become lost. Lost proof yourself, learn to use a map and compass. That aside, bushcraft is not intended to be a survival ordeal when going out into the wilds of wherever we live. Bushcraft by definition is the skill of living in the wild. That doesn’t mean we need to deprive ourselves of modern tools and equipment. If you are comfortable heading out with nothing but a pair of shorts and a hat, then do that. Most of us, however, require a few more tools and gear. Hi Paul, another excellent piece. With the exception of the morakniv, this is my basic kit. Unfortunately I was seduced by one of the bg knives by Gerber, sturdy but slightly large although this makes it excellent for batonning. I do usually use a tent, but thanks to you am progressing to the tarp and bivvy very nicely. I use a Bushbox xl for cooking, for 2 reasons. 1, it works very well and keeps the fire both contained and off the ground. And 2, I find it helps me practice my fire skills and I have greatly improved since I started using it. Have you tried it yourself? I like to have a large bandana. You. An make the into a pouch, a sling, etc. I usually have an orange one to address the visibility issue the gentleman above mentioned. Great article as always. I’m currently working on improving my knowledge of wild edibles, tree ID and animal tracking. My own studies have benefitted no end from carrying a small camera. Usually I just use my cell phone camera. This may not sound too bushcrafty, but I also keep a bunch of field guides, track ID apps, bird song recordings e.t.c. on my phone, and frequently use the phones microphone to record the calls of unfamiliar birds, frogs e.t.c. I’d never suggest people rely on a cell phone for navigation though: I never go out without a compass. Excellent Paul. It’s hard to top off your article as it is comprehensive a plenty. I used tin cans to cook in when I was young and have survived to tell the tale, although nowadays, the cans are mostly coated with plastics and vinyls, yuk. But a cheap container bought at a dollar store (or thrift shoppe) will serve well to start. I do have a suggestion, and it’s not really bushcrafty, but perhaps a sharp whistle in case of emergency? And it cannot be overstated that correct seasonal clothing is essential as your first shelter. The trick is to use what equipment you got and use it well. Enjoy the outdoors, it’s not a competition, it’s an experience. Work with nature, never against it. Keep it simple. Keep it safe. At the very least, I’d advise them to take one of those pre-packed packets of tissues, but a plastic bag with paper, a lighter and some alchohol hand sanitiser could mean the difference between a great trip and one they’d rather forget. Absolutely! … and the kit should of course include a trowel / small shovel. What are the Brown Filter Bags and where can they be found? What a great article, excellent. First of all great and valuable article. I agree with that most of the “promoted” kits from some “bushcrafters” were newer with them on the field…. maybe commercial or maybe lack of knowledge is the reason for promotion. Anyway, just get a knife, some minimum around the house equipment and GO OUT! that’s the first thing that you should do. Nobody said that read this and that and buy this list and go out in the middle of wild 3 months of walking far from civilization. You can practice your skills in most of the cases in less than 10 km from the house or in your backyard. So get a few things, go out, experience what is best fitted to you and adapt the further equipment on your personal needs. Hopefully I did not get anyone mad, this is my personal opinion. I did not care what kind of knife I take with me when I went out to a week of camping… I was not alone and not so far from civilization that my life depend on it … sometime it get broken, most of the cases from my fault but the learning and persevering in knowledge should be stuffed in our bag, not the last high tech equipment. I would suggest taking a compass and relevant map of the area you are in . The knowledge of how to use both also !! This is a nice article, I like the fact that you are more focused on the reasons why you carry something than the stuff itself. A few extra things I always carry in the woods are. Marking your olive green kit with something bright can be helpful for a beginner until you can get into the good habit of putting it away in the same place when not using it. Great article as always. As far as I can tell, you covered the basic tools and equipment to get started in the woods. I would add a good compass and food. So many bushcraft videos forget to mention food. A good practice, I think, is to put together your own daily food rations. Enjoying the experience of self sufficient bushcraft will require nutrition and that’s best if your food matches your tastes. Talk about good timing! I was just going to watch an episode of Ask Paul Kirtley as I have been wondering lately just about how much kit/gear/bells & whistles is absolutely necessary to start off with, and whether I’d gone overboard with my purchases. I was pleasantly surprised to see many items I’ve acquired to help me camp out mentioned in the article (Mora Companion, Bahco Laplander,DC4 stone, Firesteel, BCB mug). I found your article very encouraging as a beginner to bushcraft & as someone who needs to stick to a budget (even if I recently treated myself to the new full tang Mora Garberg! ), I feel a lot less worried about whether I have the right equipment to survive the remaining wilderness left in the Republic of Ireland where I live. Hopefully some day I’ll be able to come on a course with you! Loving the Ask Paul Kirtley show & being able to learn from you via your blog too. Thanks again for all the free advice & encouragement! Hi Paul, great article as always. I like to take a neck tube to keep the cold from my neck and I really feel the benefit. Also to keep you warm take a Maisie with you, my border collie she is like a hot water bottle. To my mind, the key to emphasizing skills over kit in bushcraft (or woodcraft/woodsmanship as I knew it growing up in the 60s) is to put kit items in a “make do” category. As in, “You can make do with a plastic tarp,” You can make do with a decent fixed blade knife,” “You can make do with a disposable lighter and/or a mishmetal rod,” “You can make do with a cheap, inexpensive flashlight/torch,” “You can make do with a decent mid-sized backpack,” etc. As a kid, I just wanted and needed whatever kit would work so that I could get into the jungles and explore, forage, and learn how to get along in the wilds, whether alone or with friends. Only AFTER I was exposed as a young adult to the social “value” of acquiring kit as a status totem and mark of “sophistication” did the weight and unwieldiness of my pack reach proportions that made my wilderness forays truly painful and counter productive to the easy passage I enjoyed as a teen. Fascination with kit is just the natural outcome of the consumer mentality that is destroying our environment and planet, and doesn’t belong in true bushcraft and the love and respect for nature. It is the skills you teach that open our hearts and minds to the wildness and beauty of our natural world. Fine article. As it is aimed at beginners, perhaps showing photos of fires built directly on vegetation is a problem. The photos captioned “Bringing water to a rolling boil …” and “Simple campcraft combined with good firecraft …” illustrate how to cause expensive wildfires. It’s easy enough to remove the turf down to mineral earth, set it aside, and then replace it after the fire is out and cold. Rather than offering an item to add, I’d suggest leaving the saw at home. If one is in temperate lands, wood that is down and dead is all one ought to burn. If it’s too big to break, it’s too big for the fire. Perhaps bigger logs are the standard in arctic and sub-arctic conditions. Thanks for yet another handy, informative sharing of experience and knowledge. I would be torn between, a map and compass combination, something to do after dark (in the winter) or a friend to share the experience with. I always enjoyed practicing with friends, I appreciate that some people might rather acquire the skills alone if self conscious. However i think that for a total novice knowing that they are not alone could be a good thing in the dark of a wood or forest at night. this is just my thoughts, based on the fact that my son is 12 years old. please guys always tell someone responsible your plans. Where you will be going and when they should expect you back by. Thanks again Paul, keep safe, and please keep your brilliant blog. Great work Mr Kirtly. Being a newcomer to bushcraft, I was also led to believe the expensive equipment was what you should have. One thing I have, and may suggest, is a “Trangia” type stove. Before running across your videos I purchased a 27-2 set. An alcohol stove and pot set for two. It burns various forms of alcohol, mainly Mentholated spirits. And it comes in handy if the power goes out to! I boiled a pan of water and made a large pot of tea for my wife and me. As I do not know the rules on wild camping here in Ireland I would not light a fire unless I knew for a fact that I was not breaking the law, as ignorance is not a defense! I am in the market for a tarp and have been looking at a “DD” 3X3Meter one but with lower back injuries, some suggestions on good value sleep mats (Self inflating or foam.) and where to get a bivi bag similar to the one that you use (My logic is that if you have had it for as long as you have said means it must be a good on!) or would I be better off the ground, and in a hammock? I do recall that you yourself suffer from back pain, and prefer to sleep on the ground. So I was thinking of trying sleeping on the ground first, and if that is not for me I could get a hammock, and see how that goes! Well, I have kept you for too long already! Have a good on! 🙂 Kevin. Thanks Paul for a straight forward article. The problem with YouTube is many of the contributors have hugely different motivations for their videos and what they want to get out of being outdoors differs hugely. One thing I don’t feel many of these videos mention is how important getting to know your gear is. Just because a piece of equipment suits a clique on YouTube doesn’t mean it will suit your purposes or even be worth the space/weight in your pack. Maybe it’s better to start off with not so expensive, get to know the item and it either does the job or not, then go more expensive if it’s necessary. I still use many of my cheaper items I started with, they’re tried and trusted items and highly valued. Hi Paul, love watching your vids etc. You mentioned firelighting as a main skill but only mentioned firesteels and rods for starting them. A cheap gas lighter is worth its weight in gold not just for fires but things like sealing the ends of paracord. Love your blog, and this was another great article. I’m a budding US outdoorsman, meaning I spend more time reading and learning about outdoor life/ bushcraft / survivalism than I actually get to practice it. After reading this article, I had the thought to search for an agenda for a bushcraft excursion, both a day trip and an overnight trip. What I mean is a checklist of things to accomplish, like one might get from a class in order to demonstrate what has been learned. ie, navigate to a location, process wood and make a fire, set up a shelter (for overnight trips), and so on. I couldn’t find any such thing. Could you write a post (or two – day trip and overnight trip) that provide such an agenda? My thought was to find one and then plan a trip nearby to test my skills. I know I’m being lazy and could create such an agenda myself, but I was hoping to find information from someone with a lot of experience (like yourself) that might include things I may not have thought about. For instance, woodworking/carving projects to pass the time after camp is established rather than playing cards or simply admiring what I;ve accomplished so far. I hope you’ll consider doing a post like this, thanks again for the really great blog. Hi Paul , well done! I’d add also a ligther to start a fire if one is not confident with suitable tinder . Personally for safe I always have a bic lighter with me. The things you should take with you are sometimes a little bit different because every Country is a little bit different, for example the weather (! ), and because you have different options in the shops around you, because some equipment you will not find so easy in your town. So i will write here what you should look for, if you are living in Germany. You should look at a free market, where people sell used things, for equipment that you need. Often you get a knife, a simple steel spoon, a military pot, a rucksack or a summer sleeping bag very cheap at markets like that, especially, if you tell the people, that you do not have so much money and want to go with your friend for a bit camping in your local forest. The people, who sell that old things will normally give it you very cheap, especially if you are young. For your first steps in the forest you do not need so much. I will write here a longer list, but you can take each day you go in the forest the next peace with you, so the first day you go with one peace, the second day with the second and so on, so you have enough time, to learn every thing about each part of your equipment step by step, and you habe enough time in the weekends, to look for used equipment at the markets, you can ask everybody if he has something for you, you have on your list and you can slowly collect your pocket money for the more expensive parts of your equipment. As a beginner you have so much to learn, that at first you do not ned a lot of equipment. You should learn for every thing the correct use, before you go out with the next thing. If you build your shelter in a distance of 100 meters to the forest you will also see the most wild animals, if you are quiet an well hidden in a natural shelter. You should at first ask the farmer at the beginning of the summer, if he allowes you to construct a natural shelter and a small tent and to watch out for wild animals. And from time to time to sleep there. Later in autum, if it starts to become cold and rainy, you can ask him for the fire, when it is not so dangerous for the forest. People who own a few horses or rabbits can give you some strong cordage for free, if they feed the animals with hay in rectangular bundles. On your way into the forest you will find them. Don’t forget to take some sandwiches, water in a 1 liter plastic bottle from the supermarket and some toilet paper with you. (what has to be diged in after use, it is intelligent to dig the hole with a strong stick before you use it. In Germany you do not burn toilet paper in the summer, like they do it in Britain. German forests are to dry, the risk to burn them down is to high!). If you do not find an old used knife, you get the Mora Knife 840 for 10,- € in every Bauhaus building side do it yourself shop. They sell it under the name “Bauhaus Arbeitsmesser, Mora 840”. It is there in a red sheath, and it is printed Bauhaus on, but that doesn’t matter! In other shops for gardening tools you get the “Fiskars K 40” for 10 € too, that is more or less the same knife. The next tool you need is an expensive one. It is the “Fiskars saw Xtract SW 73”. The saw is 22,5 cm long and costs 22,- €. Do not take a cheaper one, they all are rubbish, it must be the fiskars, which is made for professional gardeners use. The BAHCO Lapplander you will not so easily find in Germany, but fiskars is equal. Later, if you start with making firewood you should buy a “Fiscars uninersal axe” with 36 cm Handle for 33,- €. (You need somebody who teaches you the use of that. You will learn that in a garden colonie or on a farm, if you do not know somebody else, who can do that.) That axe is much smaller than the small forest axe from Paul Kirtley, but for the wood you will find in the german forest the small one is better. And so long people find you with that small axe and the small saw in the forest, they will think, that you are playing there, if they find you with an larger axe and a long bow saw, they will think, you want to steel fire wood they could sell, keep that in mind! But before you need that axe, you need a lot more before that, only if there would be the chance that an oncle pays for you, you should try to get this Bauhaus or Fiskars knife, saw and axe in one rush! And a pair of leather working gloves with cotton textile, not synthetic, to protect your hands, if you are starting to use the saw. Later you will need them also, if you want to take your cooking pot from the fire. Because of this use, do not take anything with synthetic textile! At Bauhaus you also get head lamps very cheap, but do not take the smallest one from Energizer with that batteries in the form of a 1 € coin. They are good, but the batteries are very expensive! As a beginner you should buy a head lamp with normal and cheap batteries. The small ones are good for far distance hiking in the holydays, but to use them is very expensive because the batteries are expensive. You find at youtube at Corporals Cornet, Dehler and if you look under “Bundeswehr Poncho aufbauen” several options how to construct a tent with a military poncho. That smaller size than the british military tarp is for Germany the better option, because it is lighter, as a raincoat more flexible and you can hide it better, because it is smaller, when you go later for wild camping tours, where you change every night your camp in the holidays. It is well known, that it is raining in britain a lot, so there the larger tarp is better, but in Germany we have normally very dry summers, so you do not really live inder your tarp, the Bundeswehr is the better option for Germany. 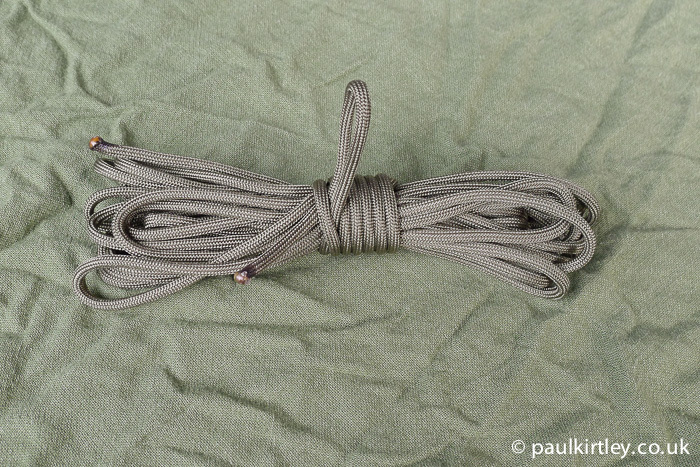 with the tarp you should get some tough but thin synthetic cordage, for example paracord, for making loops for your wooden tentnails and some lines to tie it to one or two trees. With the poncho you need two grey plastic bags people normally use for rubbish to sit on them under your poncho if it rains, if you want to do them under your sleeping bag, you cut and open them, so that they get the form of an insolation matress. An insulation matress you do not need in Germany in the summer, if it is cold or hard you can put a jacket under your sleeping bag. Only in autum and spring you should use the foldable insulation matress from the German Bundeswehr, which you can buy for 10,-€ used. It fits in the and is the back frame of the German Bundeswehr Kampfrucksack 60 liters, that costs 40 € used, and is the first choice for a german bushcrafter, because its Flecktarn Camouflage pattern fits perfectly in german natural environment, what is good for animal obsevation and wild camping tours. That rucksack allowes you to do all tours, you wants to do in germany and summer tours trough europe too. So if you buy that and treat it well, you do not need tobuy a second one in your life. If you do not find a used summer sleeping bag cheap, you should buy for summer use the Miltec Commando sleeping bag in Flecktarn. For 30,-€ if you have a friend with you, he should buy an own poncho and the same sleeping bag in olive, the us woodland isn’t so good in Germany to hide yourself in the nature. You need one or more comfortable two german military cooking pots for two people, Bundeswehr Kochgeschirr or Polizei Kochgeschirr in the same form, take it used, the new one is a bad fake! And if you want to go out in very rainy and colder conditions in spring and autum, you should buy a british army bivi bag (Biwaksack) for 40 € per person. Saw, axe and even the cooking pot you do only need one for two persons. Flecktarn clothing is light, cheap, tough and fast drying, because it has a cotton syntetic mix. The last things I wrote down you all get in your mext army shop or via internet from Raeer or ASMC very easy! I forgot to write, that a swiss army knife “Victorinox Climber” is very usefull to open tins, bottles and for longer trips to keep the fingers and feet in good conditions. I love my fire bellows (thin metal telescopic tube). I frequently use it to coax a dwindling fire back to life. It’s very lightweight and tiny. Great article. Just a thought…how do you get past the UK laws on fixed blades and blade size? Your recommendation certainly contravenes UK laws? Hi Pat, my recommendation does not contravene any UK law. I think what you are referring to is that you can only carry a non-locking blade of less than three inches without reasonable cause (e.g. a non-locking penknife). That said, there it is not illegal to own a fixed blade knife or lock knife or non-locking knife of more than three inches. Any knife can be considered an offensive weapon under certain circumstances. But this is no different to, say, a chisel. Just as a carpenter can carry tools to a job and use them on a job, so can an outdoors person take suitable (and legal) tools to the woods to use them.